I’ve been thinking a lot lately about the unsung hero of many start-ups: the other founder. A lot has been written about the founder/CEO and her growth and evolution as a company grows. But little is written about the (nearly omnipresent in my experience) cofounder – the #2, behind-the-scenes partner who teams with the founder/CEO from the very beginning to build the company. In the image above, most everyone knows the name and image of Larry Page – cofounder and now CEO of Google. 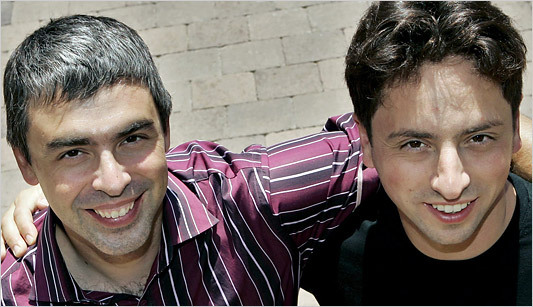 But how many folks know Sergey Brin (on the right) and the role he has played in building Google to its massive success and a market capitalization of nearly $300 billion? Sergey Brin is the other founder. I’ve probably been thinking about this topic a lot lately because I’ve been recently meeting with the other founder at a few of my portfolio companies. The conversations we’ve been having have a consistent set of themes. The other founder usually begins with a particular range of responsibilities that compliment the founder. They may run a function, such as product or engineering, or they may have a broader operational role and carry a COO title. Typically, a 5 person company doesn’t need a COO, but it’s a useful catch all title for the other founder because it sounds better than “vice president of miscellaneous” or “SVP of whatever falls through the cracks,” which are more accurate descriptions of their role. The challenge for the other founder is that as a startup evolves from “the jungle” (super early stages, chaotic organization, prior to achieving product-market fit) to the “dirt road” (developing some organizational maturity and initial product market fit), senior functional executives often get hired from the outside to take over departments. These executives naturally encroach on the other founder’s responsibilities. For example, at one of my portfolio companies, the other founder looked after administration, finance, operations, product and engineering. Basically, everything but sales and marketing. But then the company hired a VP of operations. And then a VP of finance. And finally a VP of engineering. And suddenly, after transitioning each function successfully to an outside senior executive one at a time, the other founder had successively worked himself out of a job. The board and investors are super focused on making the founder/CEO successful – building an executive team around them, perhaps even a COO/president to compliment their skill set and help the company scale. Or, as in the case of Google’s hiring of Eric Schmidt, an outside CEO who can guide growth and scale. In these situations, everyone is focused on the impact on the founder – what his role will be, how he handles the transition. Very little board attention is typically focused on the role, evolution and growth of the other founder. I would submit that ignoring the other founder is short-sighted. I recommend boards and CEOs spend more time worrying about the role of the other founder and helping her successfully evolve over time. Typically they are intensely loyal to the company and the founder/CEO, valuable sounding boards for the executive team and the founder/CEO and champions of the company culture and mission. 1. Become a functional owner. The other founder may be “VP of miscellaneous” in the beginning days of the startup, but be explicit about which functional area she should expect to own over time. That way, she can develop the skills in that area in a focused fashion and slot in appropriately when the time is right. Product management is a popular functional area for the other founder as the other founder is typically close to the customer and business problem being solved. Further, the role doesn’t involve managing tens or hundreds of employees, a skill that is typically better suited for experienced functional operators. Another one is business development for similar reasons and because it involves selling the company into an ecosystem of partnerships, requiring a blend of product knowledge and marketing skills. 2. Grow into the COO role. CEO/cofounder, Mr. Outside role and the other played the COO/cofounder, Mr. Inside role. Even as the company scaled, the young COO rapidly learned how to be a successful operator at scale. I have had other companies hire coaches to help the young other founder grow into the COO role. For the right profile, this can be a great role for the other founder. 3. Drive the next strategic initiative. As startups evolve into functional startups, they get very focused on the here and now: shipping the next product release, successfully closing the next quarter, closing an important partnership. Yet, startups need to always worry about what’s around the corner and have resources dedicated to strategic initiatives that can provide non-linear growth. This is an area where the other founder can be very valuable. Because of the respect he has within the company and their ability to cut across functions, he is well positioned to drive strategic initiatives and providing the “startup within a startup”culture necessary to innovate. This set of themes is one that I’m personally very familiar with because I played this role at one of my startups, Upromise. My title at the start was president and COO – thus I initially played the Mr. Inside role and rapidly grew into running a large organization. Then, as we hired a skilled operational CEO, I transitioned to driving strategic initiatives. I guess that’s why I’m always a sympathetic ear for the other founder.